An indigenous take on European design creates a stunning visual overload. 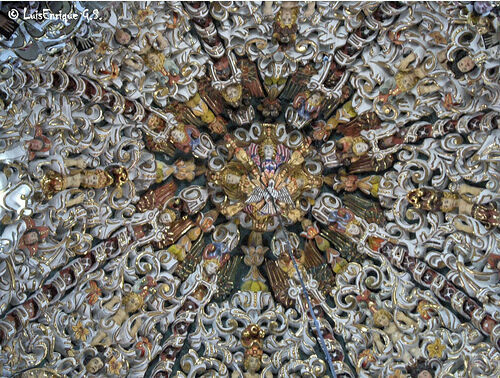 Upon entering the Church of Santa María Tonantzintla, visitors are confronted with a spectacular mosaic of religious imagery. A park in Mexico offers all the experiences of an illegal border crossing except for one: the border. A dark tunnel leads to a striking white crater that seems to be from another planet. Ornate plaster molding painted in bright, vibrant hues covers every last inch of the church’s interior walls and ceilings, creating a somewhat crazed effect best described as ‘horror vacui,’ or a fear of empty space. 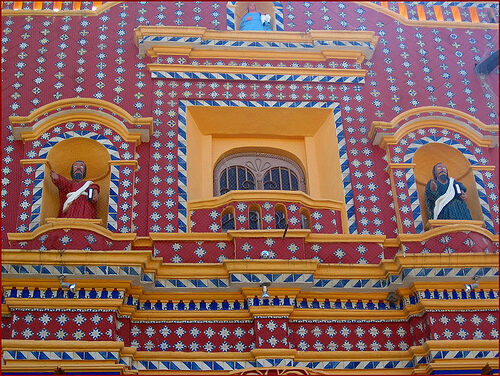 Construction on the Church of Santa María Tonantzintla is believed to have begun in the late 17th century. 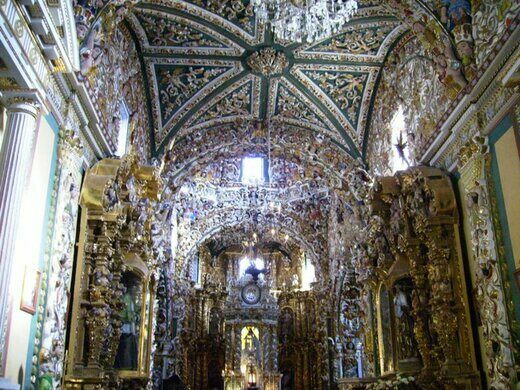 By most accounts the church was intended as a native adaptation of the nearby Capilla de Rosario (Rosary Chapel) which has a similarly ornate interior, though significantly more subdued when compared with that of Santa María Tonantzintla. 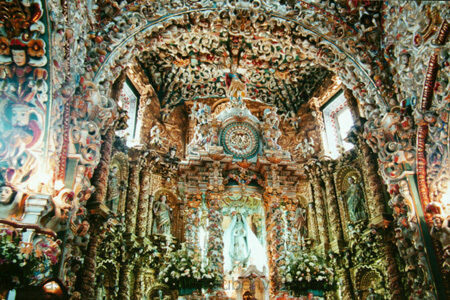 Whereas the gilded gold stucco molding adorning the walls and ceiling of Capilla de Rosario is done in a fairly traditional Baroque style, the interior of Santa María Tonantzintla is packed with a veritable explosion of faces, figures, masks, flowers, fruits, and birds alongside more abstract decorative design features. The figures that populate the walls have been described, perhaps somewhat condescendingly, as cruder than those found in traditional European architecture, but such stylistic differences give the church a distinctly regional flair rarely found in post-colonial design. 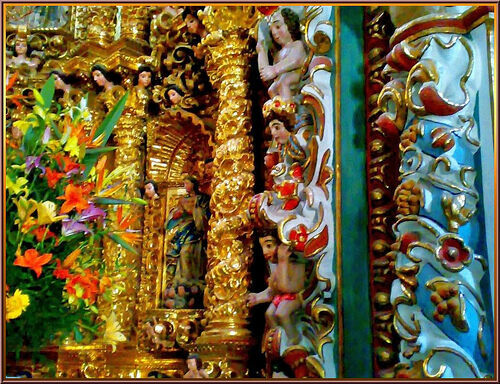 The fusion of European and indigenous Mexican cultures goes beyond mere aesthetics; the name itself exemplifies the incorporation of Christianity into the indigenous culture. Following the introduction of Christianity to the region, the Aztec goddess Tontantzin, for whom the church is named, was re-appropriated as an iteration of the Virgin Mary. 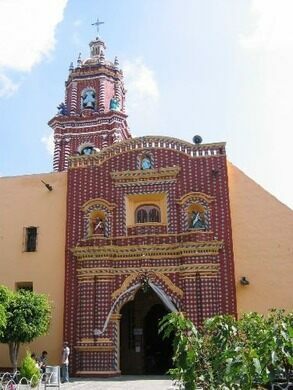 The church operates independently from the archdiocese of Puebla, and is associated with the cult of the Virgin of Guadalupe, Mexico’s patron saint. An Aztec temple, the largest man-made pyramid in the world, sits buried in earth with a Spanish church set on top. The "world's smallest volcano" has been used to store meals and dispose of dead bodies. Hidden inside a hotel is a museum of miniature models depicting the traditions and history of Mexico. This overgrown Victorian chapel made of corrugated metal looks utterly out of place. This church looks more like a spaceship than a house of worship. This open air cathedral invites all faiths to worship under the only roof big enough to fit them all: the sky.